How To Make Your Airport Experience that much better! My AirPort Excursion & Discovering the Airport Sherpa App! Hello Luvs, I hope you are having a wonderful weekend!! Now you know when I find amazing local stuff I always share it with you. I had such a great experience today with the coolest app that I found out about while I was in BWI airport. A good friend of mine is in Florida on vacation and his daughter came back 2 days sooner, so naturally I was there to pick her up. Now granted the airport is not always my favorite place to hang out, to make it even worse her flight got delayed an hour. We all had plans to go to dinner after we picked her up, so I didn’t eat anything before I came, so by this time I was absolutely starving and I wondered what I would do? While I was waiting by the security check area a woman told me about the coolest app called Airport Sherpa. With this free app you can order food from all the great spots in the airport, and they will bring it to you wherever you are, pre-security at that. 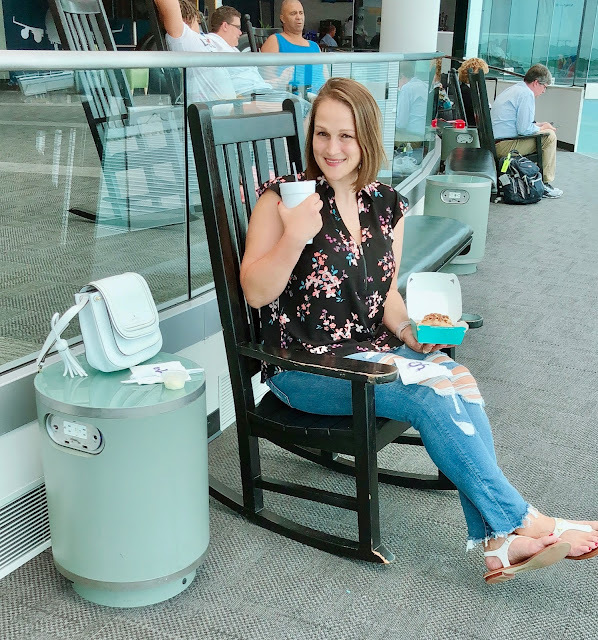 So I headed to the observation deck, another awesome airport first for me and a great little spot where you can look over all the runways, sit back in a comfy chair, charge your phone, chill and in my case eat. I settled in for my hour wait and ordered myself some food, drinks, and of course a #Cinnabon. All in all I have to say that Airport Sherpa made my airport experience pretty fantastic, I’ll forever be using this app anytime I’m at BWI, especially when I go to Greece later this year. You should grab the app for yourself, you will love the convenience it brings. Just click on the link below, depending on what operating system you have. If you have any questions at all check out their page on Instagram or Twitter @AirportSherpa. Here are some yummy shots of the food Rob and I ordered, I got a turkey BLT and Rob ordered a cheesestake sub and wow did it hit the spot, not to mention the Cinnabon was gooey and hot just like it was supposed to be. The food made it to us suer fast and hot, I definitely couldn't of been more happy with the Airport Sherpa employee, she was super nice and more than helpful because it was obviously my first time using the app, which was suer easy to maneuver. Plus I also loved that I was able to order different items from different stores, that made the whole experience that much easier. I definitely recommend downloading the Airport Sherpa App and then next time you travel through BWI Airport you will be able to try it for yourself!! an you best believe after my belly was full that a quick shut eye while i was waiting for sure took place...hey I'm only human and I was super comfy. Y'all have a wonderful week and don't forget to follow us on social media, we have a lot of amazing giveaways coming up!! & OLD BAY Go Hand In Hand!! There's nothing better than a good ole' fashion summer cookout, as long as I can remember it's just something we have always done. 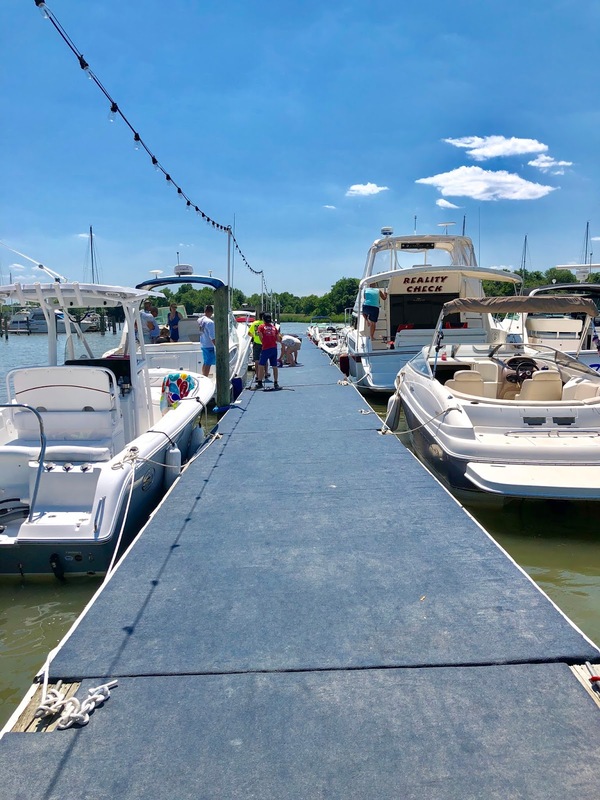 When I was a kid my grandfather had a boat slip off of Fort Smallwood Road, in Pasadena MD. All summer my brother Jason, and I spent the days with PaPaw down at the boatyard fishing, catching crabs, and swimming in the Chesapeake Bay. We also had all kinds of fun summer cookouts and get togethers, with family and friends, and there was always good food. 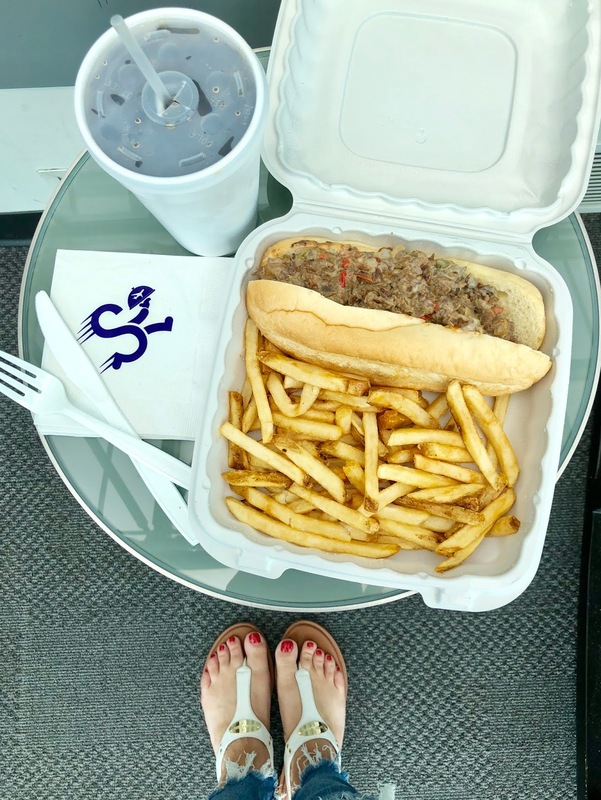 I specifically remember the yummy burgers and fries, steamed crabs, soft shell crab sandwiches, chicken skewers, and much much more. Each one of these yummy dishes were flavored or seasoned with OLD BAY, it was always a staple at any summer activity where food was involved. 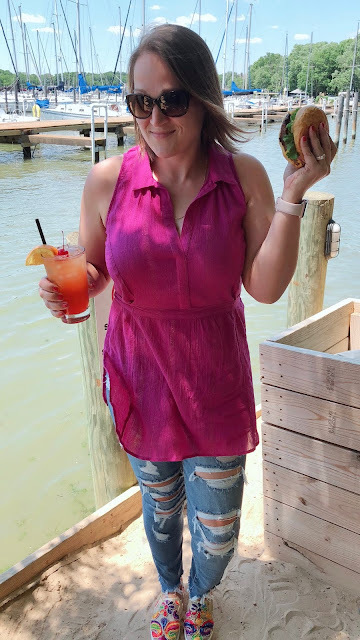 One of my absolute faves was the OLD BAY Burger, I have a recipe that has been in our family for what seems like forever. With today being the first annual OLD BAY Day, I just had to share it with you guys, it's absolutely amazing and super easy to make. 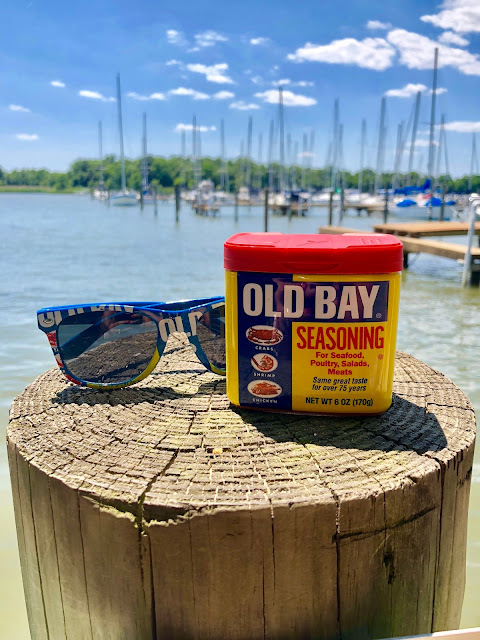 Make sure you follow OLD BAY Seasoning for great recipes and updates!! 7. For serving you will need some freshly sliced beefsteak tomatoes, lettuce, pickles, and Amercian cheese. 1. Combine the ingredients for the patties into a bowl, do not over mix. 2. Separate the mixture evenly into 6 patties. 3. Get the grill heated up to high, then place the burgers on the grill and cook for 3-4 minutes on each side, until you have beautiful grill marks, or until thoroughly cooked. Serve them on big, soft, sesame seed buns with desired toppings. I just love lettuce, tomato and mayo, it always goes amazing with that OLD BAY flavor. 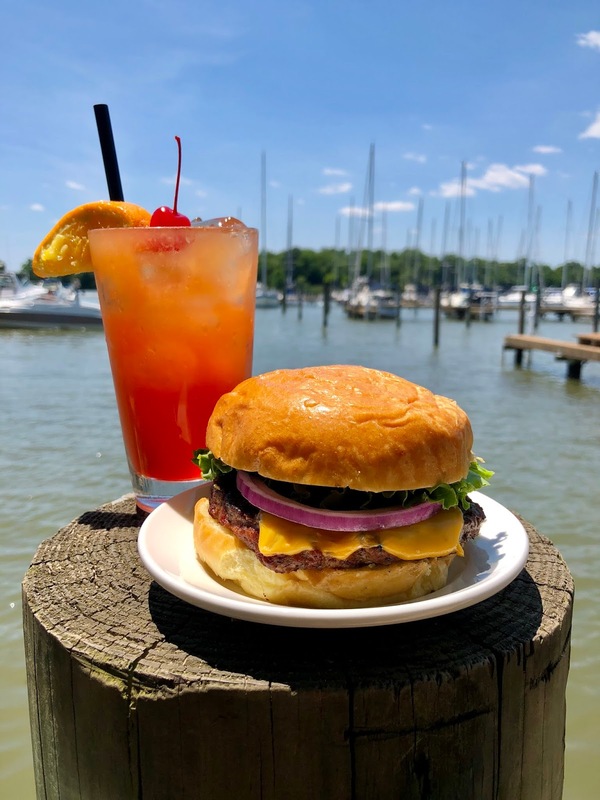 Have you ever had an OLD BAY Burger? Now that I think about it, they would make fabulous sliders as well, all you would have to do is portion them into smaller sizes. I think 12 would be the perfect number, which would work perfectly as a great group appetizer. 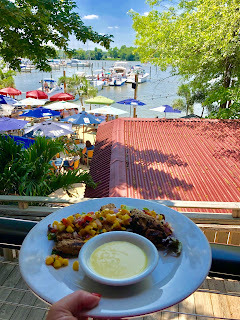 There is also a great OLD BAY seasoned jerk chicken dish, it comes smothered in fresh mango salsa, with a side of honey mustard sauce for dipping. That's another amazing recipe that i'll definitely have to get and share with you guys. Today we did attended a great little shore side event that really brought back some memories of the old days, and all those amazing tasting recipes that went with them. 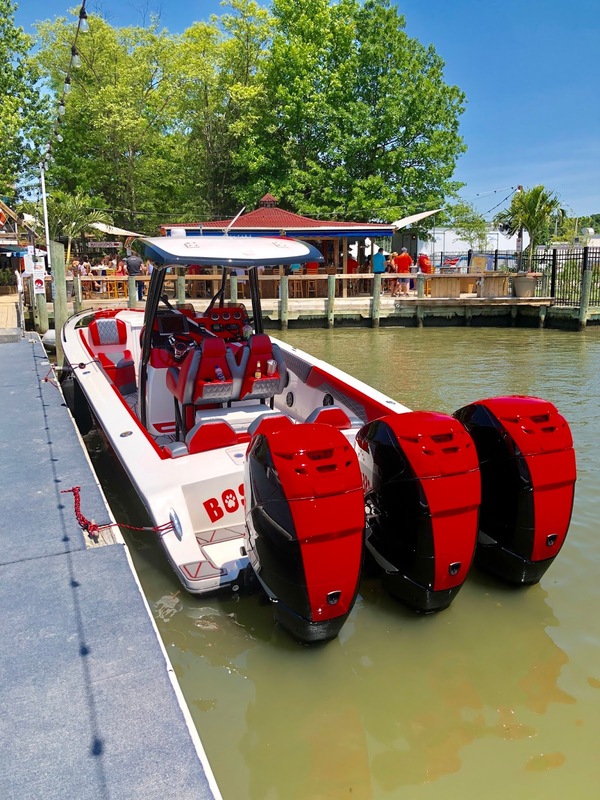 All day I felt like I was in a time machine, all of the boats, the sun and the salty smell of the bay. All the kids where swimming and playing on the beach, the moms where sipping fruity cocktails, and the dads where grilling and talking away. It's just that simple life that makes you feel content, I have to say it's the absolute best. As you can see once it was done I definitely couldn't resist the food, that's what I call real fun in the sun...lol! 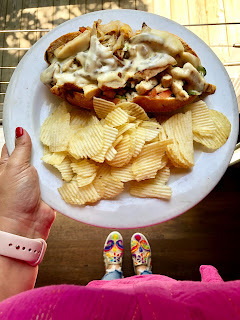 I've been working on a chicken cheese steak sub recipe, like the one you see above. The only difference with mine is it will be accompanied by some fresh cut, OLD BAY seasoned french fries, and they'll be the boardwalk style like you get in Ocean City, nice and thick. I haven't had fries like that in forever, so I'm really looking forward to it. Food like this just screams summer to me, especially when it's seasoned with OLD BAY! As you can see in the image below I got myself a sweet little drink to go with the burger, but usually I just order a Natty Bo because I find that beer usually goes better with a Bay Burger. I also think it would be even more amazing to stack a fried soft shell crab in between the bun and the burger itself. I'm super bummed I can't eat shellfish anymore because that idea would have for sure been made a reality. To be honest i miss the heck out of soft shell and steamed crabs, it's so weird how you can eat something your whole life than BAM one day you are just straight up allergic to it. 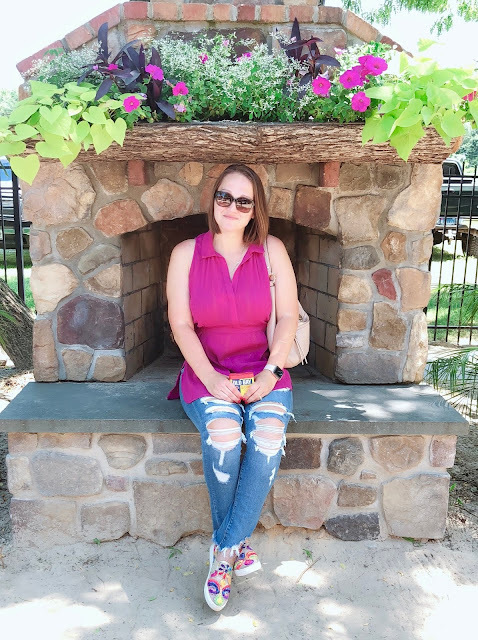 To tone up the day and of course look cute and stay cool, I wore a fun little tunic top I scored from Anthropologie, and paired it with some ripped jeans from American Eagle Outfitters. Then I added my Wanted embroidered slip on sneakers. Turns out they match the top perfectly, I just love it when that happens. Especially when it's my absolute favorite pair of shoes, well second pair of them that is. I had another pair that Piper chewed all to heck, I begrudgingly bought another pair asap, I didn't want to take the chance that I wouldn't be able to get them again, so I ordered a second pair. Thank goodness they're only $50 or they would have been history. I accessorized with my Tory Burch sunnies, and my pink Apple watch band. All in all it was a great look that I'm so glad I didn't spill anything on. I say that because I spilled a burrito on a brand new white top that I wore "for the first time" to Hon Fest last weekend, needless to say I was super ticked off...lol! As you can see in the images above, we had a good group of people show up pier side. There was good music, good food and good company, and what's better than that? I hope your weekends where as great and you all had a wonderful Father's Day. Also if you have any good recipes please share them with me, i would love to see what you make taste great with OLD BAY seasoning, i think I may try a great grilled corn on the cob recipe as well, that sounds like it would taste good. Wow I have so many ideas that I would love to put in effect, I would also love to hear what you guys think of the Bay Burger, if you make them definitely comment below with your opinions. Easy enough right? 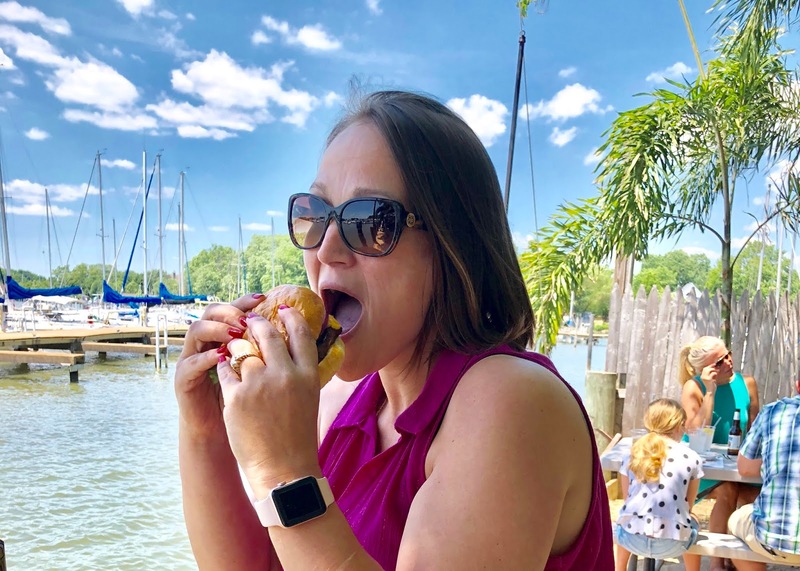 I can't wait to see your pictures, plus this should be an easy one since OLD BAY is iconic for delish summer dishes. Here's to the Fabulous Summer of 2018!! Don't Forget to Follow us on Social Media!! 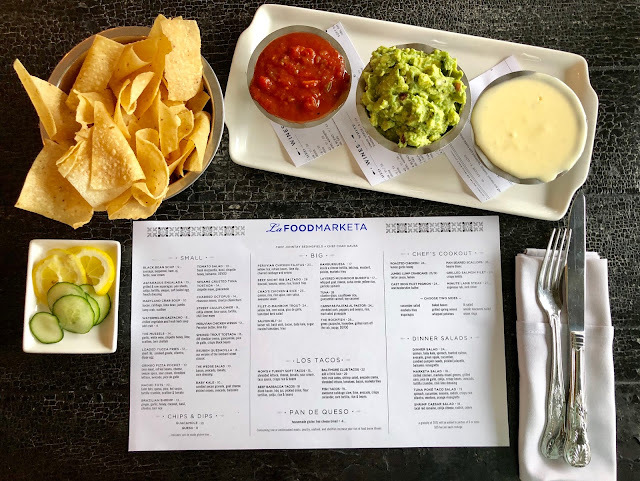 About two weeks ago Rob and I discovered a great little restaurant called La Food Marketa, it's off of Green Spring not far from my house, I would say about 6-8 minutes away. 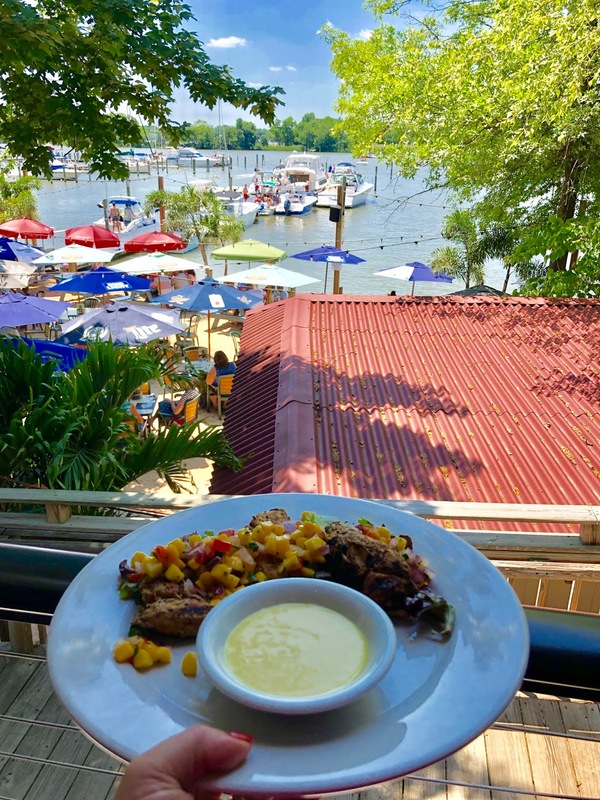 The exact location is 2620 Quarry Lake Dr, Baltimore MD 21209, I'm also going to note the phone number because this place is always packed, and you definitely have to call ahead and make a reservation during the evening shift. 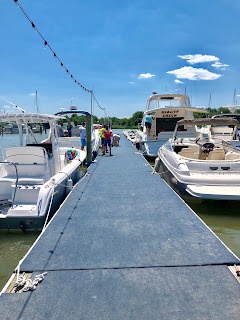 We got there at 5pm and there were people already waiting for the doors to open, and i ish you not within 15 minutes the parking lot and ever seat in the restaurant were full.The phone number is: (410) 415-0606. 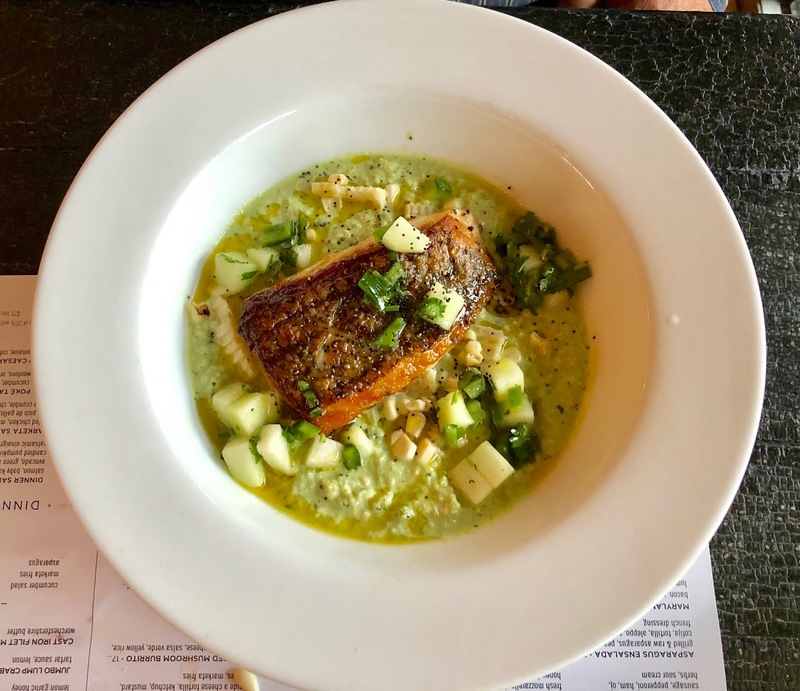 What I did was make a reservation through OpenTable, it's a great little app that let's you make a reservation via your cellphone for just about any restaurant, anywhere. It's so convenient and it's also free, not to mention it will find you different types or restaurants in your immediate area. Incase you aren't familiar with the area, it's definitely come in handy for me many times over. La Food Marketa in particular is open for breakfast and lunch from 11am to 2pm, then they close for a couple hours, and re-open at 5pm to 9pm or 10pm, depending on what day of the week it is. Check out their website (La Food Marketa Website) for the exact hours of operation on what days. 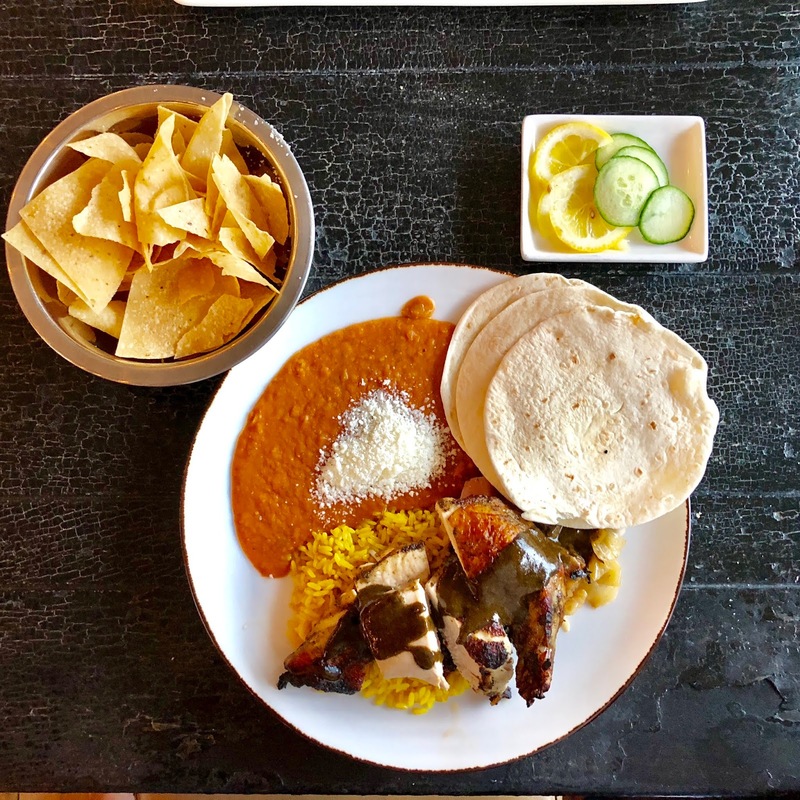 As you can see in the image above we started off with the chips and dip trio, it comes with queso, guacamole, and salsa, with the perfect tortilla chips, they're super thin and crispy, just how i like 'em. Rob really loved the queso cheese dip, it's one of his favorite Mexican appetizers as long as its the creamy kind. The type where they actually melt the cheese, then it gets hard and cold in like 5 minutes and turns into this thick, gooey ball and is no more good. 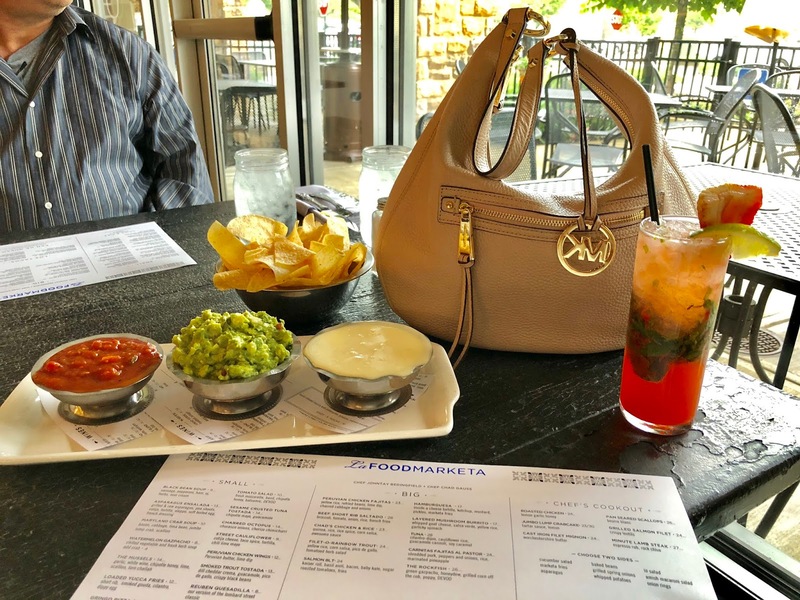 We tend to stay away from that type, the consistency of the queso we like is more like nacho cheese. I was super excited to find that they serve drinks, so I ordered myself a strawberry mojito to go with my chips and queso. WOW was it good!! We enjoyed the chips and dips for some time while we waited for our entrees. I ordered the Peruvian Fajitas and Rob got the Rockfish, needless to say we were both overly pleased with each dish. Mine as you can see below came with the Peruvian spiced chicken, some refried beans, rice, and a cabbage and onion mixture. Then the dish was topped with a delish and super flavorful sauce, sided with lime dip and a couple of soft warn tortillas. OMGoodness the entire dish was amazing, and the chicken was cooked to perfection, Rob said the same about his, and it's always super hard to please him where food is concerned because he is very pick. Happily he exclaimed how it was cooked just right so it was in turn very flaky. The fish itself as you can see in the picture sat atop a lovely little stew that he described as very flavorful. Let's just say that by the end of the meal we were both stuffed and happy as can be, I didn't even save room for desert which isn't like me. We will definitely be going back for more, as a matter of fact we have already been back once since this trip here. If you live in Maryland or DC even, it's definitely worth the trip to check out La Food Marketa, it's a great little atmosphere, and the staff is super nice, very helpful and on point. You can't ask any more from a restaurant, and to top it all off the price point is perfect. It's more than affordable, my only regret is that I didn't save room for dessert because they had some great choices. If you know of any good restaurants in the Baltimore area, or anywhere in Maryland for that matter, that you would love to see me review definitely let me know by commenting below. I'm always looking for good spots to share with everyone. You never know it may head up my next post, and I will definitely give you credit for the referral. Have a wonderful day and don't forget to follow Piper and I on social media!